The transportation industry had the greatest percentage of deaths, accounting for 40 percent of the workplace fatalities that happened during the year. Deaths resulting from workplace violence followed transportation deaths and increased by 23 percent from 2015 to 2016. Deaths from slips, falls and trips increased by 7 percent in 2016 over the number who were killed in 2015. These types of accidents have increased by 25 percent since 2011. In 2016, the number of overdoses at work increased by 32 percent. Overdoses at work have increased by 25 percent annually since 2012. While fatalities at work happen across industries, they are more common in certain sectors. The BLS reports that extraction workers and first-line supervisors in the construction industry suffered the highest number of deaths at 134. Groundskeeping and landscaping accounted for 125 fatalities. A total of 101 roofers were killed. Other types of jobs with high numbers of fatalities included tree trimmers, drivers, auto mechanics and agricultural workers. Asian workers had the highest increase in the number of deaths in 2016. During the year, 160 Asian workers died, which was an increase of 40 percent over 2015. African-American workers suffered 587 deaths in 2016, which was an increase of 19 percent over the 495 people who died in 2015. In 2016, workers ages 55 and older accounted for 36 percent of the workplace fatalities. By contrast, older workers accounted for 20 percent of the fatalities in 2015. The leisure and hospitality sector saw an increase in fatalities in 2016 of 32 percent. Food service workers had an increase in fatalities of 40 percent during the year. 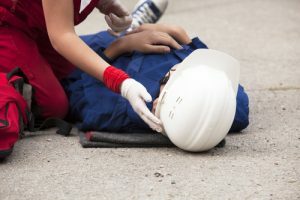 When workplace accidents result in worker fatalities in California, certain surviving family members are eligible to recover death benefits from the employers’ workers’ compensation insurance carriers. People who are eligible to receive these benefits include the spouse, child or other dependents of the workers who are killed in accidents or who die because of illnesses caused by their work environments. The eligible family members must seek these benefits no later than 240 months after the date of the injury. They must also seek the benefits within one year of when the death occurred. Death benefits are paid at the same rate as total permanent disability payments, but they will not be less than $224 per week. Being able to hold a third party liable in a wrongful death action while also recovering death benefits through workers’ compensation may allow surviving family members to recover maximal damages so that they are fully compensated for all of their losses. It is devastating for families when their loved ones are killed in workplace accidents or succumb to illnesses that they have contracted because of their jobs. If you have lost your loved one to a workplace injury accident or a work-related medical condition, you may need legal help. It is important for you to talk to a Los Angeles personal injury lawyer who is experienced in handling workers’ compensation, personal injury, and wrongful death claims. Your lawyer may thoroughly investigate your loved one’s case to identify any third parties who may hold liability in addition to your claim for death benefits. Contact our office today to schedule your free consultation.